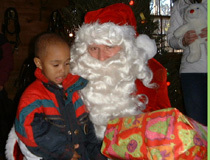 Santa Claus flies to the Devon Glen Farm in Hamiliton Massachusetts at an Education Outbound sponsored special event over the Christmas Holidays. Education Outbound sponsored a special event over the Christmas Holidays. 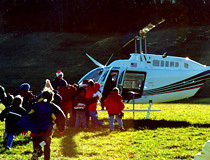 Santa Claus was flown in by helicopter to Devon Glen Farm in Hamilton Massachusetts, where over 100 underprivileged and needy children from foster homes and children's shelters (in the North Shore Area) waited with great anticipation. The children ranged in age from 2 to 14 years old. 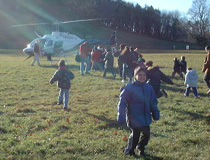 When the helicopter landed and Santa hopped out, all the children ran to greet him! 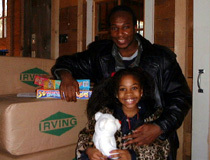 After a lot of hugs, Santa then distributed gifts to all the children inside the barn. All the children had a terrific time and really enjoyed meeting Santa, opening up their gifts, visiting with all the animals, riding in the hay wagons, and sipping hot cocoa and gobbling up chocolate chip cookies. It was a day that Education Outbound will never forget; a day filled with laughter, bright smiles, open arms, and a great deal of happiness. by Bill Woolley , Published in the Community Newspaper Company and the Hamilton Wenham Chronicle. We know. The most appropriate use of this space in your hometown newspaper would have been to sort out all the numbers, statistics, formulas and percentages that come attached like barnacles to the latest budget debacle. It would be perfectly fitting to come up with a perspective on the problem, pick a suitable scapegoat, and settle on an opinion about what ought to be done and why. Discussions about state and local budgets have been, after all, the unwelcome guests on our newspaper pages, TV screens, and at our holiday parties this week. When added to the emotional and economic fallout from the Sept. 11 attacks, we have precious little time left to ponder the more poignant moments usually ushered into our hearts with the arrival of December. Consequently, the call that came into the Chronicle late last week was met with more than just a pinch of Grinch. Another arrival of Santa, we were told. By helicopter, they said, at some farm in Hamilton. Honestly now, how many times can we cover the arrival of Santa before becoming of kindred mind with Scrooge? 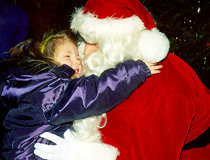 Santa, we believe, has set some sort of record for appearances on the North Shore this year. 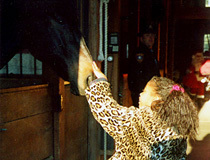 In our communities alone, he’s been booked at the Wenham Museum, the Community House, and in who knows how many schools. In nearby communities, the jolly, old elf has arrived numerous times in parades, at shopping malls and on lobster boats. Bah, humbug. We have budgets to discuss. Then we learned the rest of the story surrounding Santa’s arrival by helicopter at Devon Glen Farm, owned by the Donovan family of Hamilton. 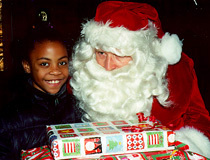 This Christmas moment was going to be brought to you by Megan Connolly of Education Outbound, a non-profit organization that provides field trips for students in disadvantaged schools, as well as for children living in group homes or shelters. “I’ve always wanted to have a positive impact on children like that,” said Connolly, a 27-year-old Hamilton resident who started questioning her career path as a classroom teacher a couple of summers ago. “When I was growing up, we went on lots of field trips and they meant so much to me. Like a farm, for instance, and hayrides. Like horses and cows and sheep and goats. Like meadows of soft, green grass that stretch out to wooded hillsides. Like barns where you could get hot chocolate and homemade cookies. And yes, like Santa arriving in a helicopter to give real gifts to children who go to bed every night without knowing where mommy and daddy are. And so, on a sun-splashed Saturday afternoon, 100 such children were herded out onto a field at Devon Glen Farm. On the way, one young lady, maybe 10 and already embittered by life, whacked at a tree with a stick and muttered to no one in particular, “If Santa even does come, he better have presents.” A veteran of disappointment, she was preparing herself, it seemed, to face one more. Eventually, the children could hear the faraway rumble of an engine and see the bug-like silhouette of a helicopter in the distance. Soon, it came closer but was lost in the blazing sun, leaving children quinting and holding mittened hands over their eyes. Moments later, as the rumble became a roar, the aircraft swooped down into view in front of the young and, by now, awestruck audience. Never this year, maybe never in their lives had such a simple glimpse of red clothing carried such sheer and unspeakable excitement. After the helicopter hovered, as piloted by John Donovan Jr., it settled softly on the ground. When Santa (a.k.a. George Lantz, Donovan’s amply pillowed brother-in-law) finally stepped out, the children were given the OK to dash across the field. Away they went… even that little girl who’d dropped her stick, as well as her anger, somewhere back by that tree she’d been whacking. You don’t have to tell us, Ms. Connolly. We saw it for ourselves… and somehow, for an afternoon at least, municipal budgets were the farthest thing from our minds. Education Outbound would like to thank all of the contributors that helped to make this special event happen.